Place chicken in sealable gallon plastic bag. Combine remaining ingredients, except skewers; stir to dissolve salt. Pour over chicken and shake bag gently to coat. Seal bag and refrigerate 8 to 10 hours, turning bag over once. If using wood skewers, soak skewers in water 15 minutes. Preheat grill to medium-high heat. 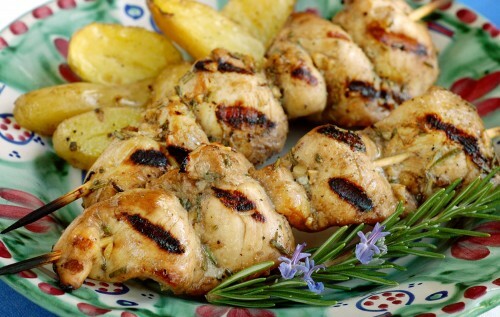 Drain chicken well; thread onto skewers. Grill (or broil) 5 minutes. Turn over and cook 4-6 minutes more. * I prefer Barengo or Holland House balsamics; the rich flavors are there with lower acidity, making them more versatile than others. Be sure to marinate less time if using a balsamic vinegar with more than 6% acidity. Delicious! With beet salad on homegrown lettuce with basil flavored goat cheese. Perfect summer evening to eat outside. Will definitely make your recipe again! So glad you think this is a tasty one, Cathi. I lean toward easy recipes with plenty of flavor for most of my recipe development.